Ivan John, Mike O'Donaghey, Heinz Stehling, & Jim White having lunch north of Creekside, 1983. 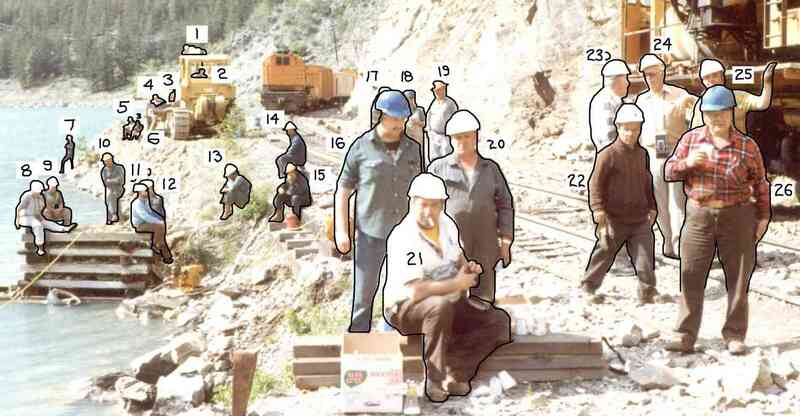 A number of photographs in RAILWAY ROCK GANG include people who are not named in either the caption or the text. The following is a preliminary list of additional names "for the record" which may or may not be included in a future edition of the book. Most of the wrecking crane crews are not named, as I never got to know most them by name during the projects. If anyone can add names to the photos it would be appreciated.